With the recent update from Google, “OK Google“, the voice assistant’s response will sound more natural than ever.Google Now voice commands will help to find anything related to your interest like what is, how to, open etc. kind of commands. We will going to share with a smart list of “OK Google” Commands which will help how to use “OK Google” commands through your android smartphone. There are two ways to say a “OK Google” command. With newer Android devices, just say “OK Google,” followed by a question or task. For example, if I wanted to know the weather, I could say “OK Google, what’s the weather like today?” and a few seconds later Google Now would provide the forecast. Tap on the microphone button in the Google search bar, and skip the “OK, Google” portion of the conversation. If the search bar isn’t on a home screen, swipe right from the primary home screen to see Google Now. If “OK, Google” isn’t working for you, make sure that feature is enabled. Head to the Google Now app, go to Menu > Settings > Voice > “OK Google” detection. Where is the nearest [hotel in gurugram]? What is price of iphone 5SE ? What are some good places around here? How do you say [good morning] in [hindi]? What is [190,000 INR] in [dollars]? What’s the flight status of [Air India] flight ? what is release date of Dishoom Movie ? Who is Salman Khan ? Who is actor in Madaari Movie ? Show me gift ideas for [diwali festival]. Give me a motivating quote. What does the Dog say? Say “Metronome” to start a metronome. How many calories are in vanilla ice cream? 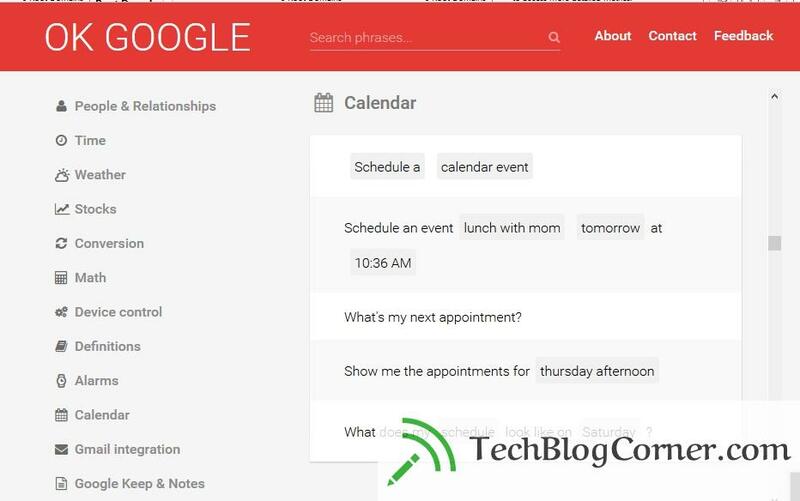 Below is some commands list of “OK Google” for calendar time settings. And so on and so forth. The site overs a total of over 1000 example permutations for these commands, too. I didn’t even know the “increase brightness” one was a thing, or “set volume to full” (max also works). In fact, I’m discovering even more permutations that the site doesn’t list – set brightness to maximum/minimum, for example.